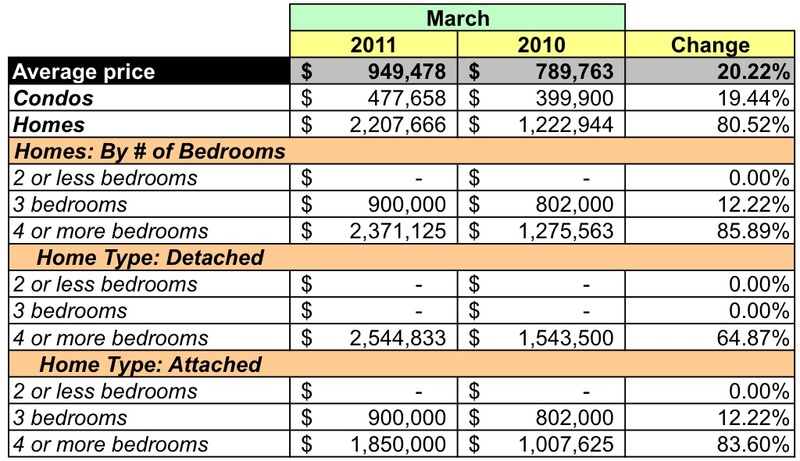 In this post I look at contracts closed in March 2011 in zip code 20005 using data released by MRIS. 20005 is roughly bounded by Q St NW on the north, F St NW on the south, 11th St NW on the east, and 16th St NW on the west. It's home to the Logan Circle and Thomas Circle neighborhoods. Given its pivotal role in rejuvenating the area, one could say it's the neighborhood that Whole Foods built. Compared to the same month in 2010, aggregate dollar volume was down 13.6%. The average sales price rose 41.39% and the median sales price was up 30.59%. The average price for a condo rose 36.72%. No homes were sold in March. 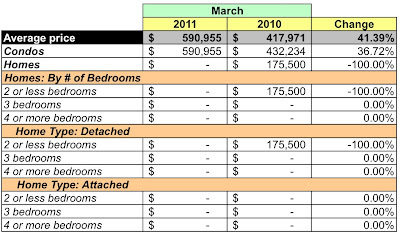 Few homes have sold in 20005 during the past 12 months so the fact that none sold in March isn't that unusual. The 11 condos sold for prices between $200K-2.5MM. The one condo that sold for $1-2.5MM probably skewed all the metrics reported in this post. Unit sales for condos fell by 35.29% resulting in a 11.53% reduction in dollar volume. Zip code 20005's dollar volume in March 2011 was 2.32% of the District's total that month. Its average sales price was 16.64% higher than that of the District as a whole; the median sales price, 37.55% higher. The zip code's 11 units were 1.99% of all units sold in the District. 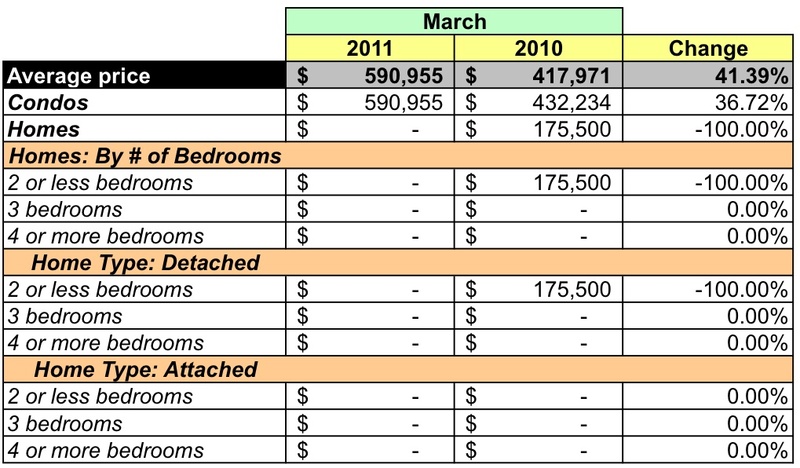 At March's sales rate there's a 4 months supply of homes and condos listed in 20005; there's a 3.5 months supply for condos. Since no homes sold in March and few sold during the past 12 months, it's difficult to quantify the months supply for homes based on sales other than to say 5 homes were listed in March. Regardless, sellers should do well. According to MRIS, properties in 20005 sold for 97% of the listing price. Zip code 20005 offers slim picking for those who want to buy something other than a condo - 95% of all units sold in the past year were condos. Given the paucity of non-condos sold in the zip code, I have to believe anyone who does buy a home [not a condo] in the area should be aware of potential comparable sales that could be used in the mortgage appraisal process. 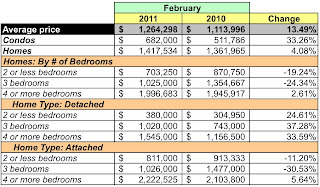 In this post I look at contracts closed in February 2011 in zip code 20020 using data released by MRIS. Zip code 20020 is home to the Anacostia, Naylor Gardens, and Fort Stanton neighborhoods. It's the home of Fort Stanton Park and will soon be the home of the new headquarters of the Department of Homeland Security (DHS) on the grounds of today's St. Elizabeth's hospital. Compared to the same month in 2010, aggregate dollar volume was down 25.89%. The average sales price fell 25.89%, too, and the median sales price was 10.81% lower. Two condos and ten homes sold in February. 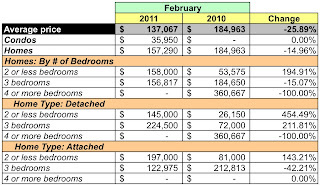 The average price for a home fell 14.96%; no condos were sold in February 2010. Dollar volume for homes fell 29.13%. No home sold for more than $400K in 20020. 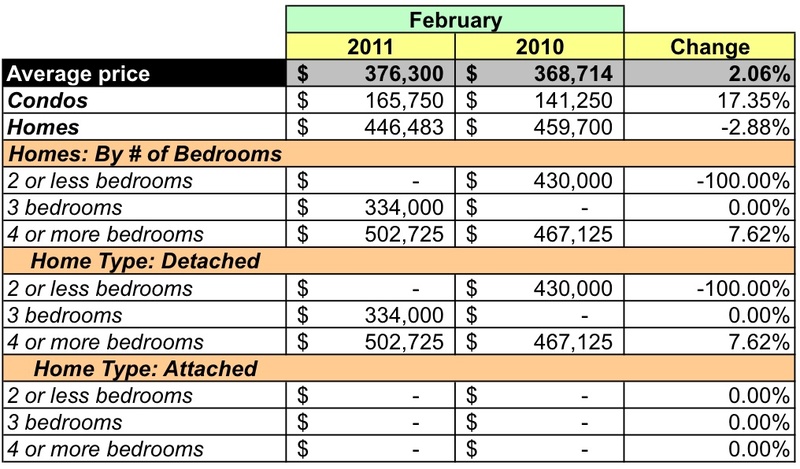 The two condos sold in February went for less than $50K. Zip code 20020's dollar volume in February 2011 was less than 1% of the District's total that month. Its average sales price was 70.54% less than that of the District as a whole; its median sales price, 63.33% less. Its 12 units were 3.25% of all units sold in the District. 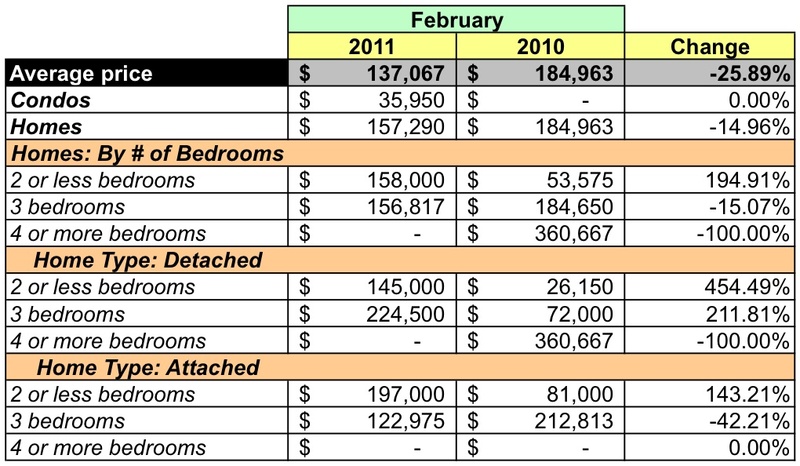 At February's sales rate there's about a 14.4 months supply of homes and condos listed in 20020; more specifically, a 33 months supply for condos and 10.7 months for homes. 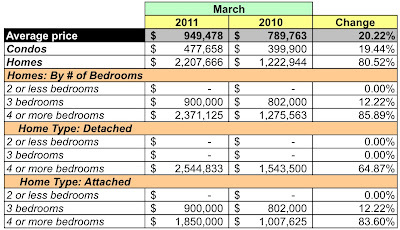 According to MRIS' data, no condo is listed for more than $300K and only one home is listed for more than $500K. February's total sales activity (closed and new contracts) was the best since 2008. It's definitely a buyer's market - MRIS reports that properties sold for 81.47% of the listing price. Given the price points I've mentioned and the imminent arrival of DHS' new headquarters at St. Elizabeths, far-sighted home buyers and investors are wise to consider properties in this zip code when making a purchase. As DHS consolidates workers today spread among more than 40 buildings throughout the area onto the DHS St. Elizabeth campus, demand for nearby housing and services is sure to soar. 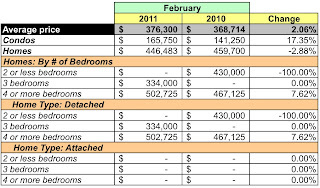 In this post I look at contracts closed in February 2011 in zip code 20912 using data released by MRIS. The zip code is home to Takoma Park, MD. 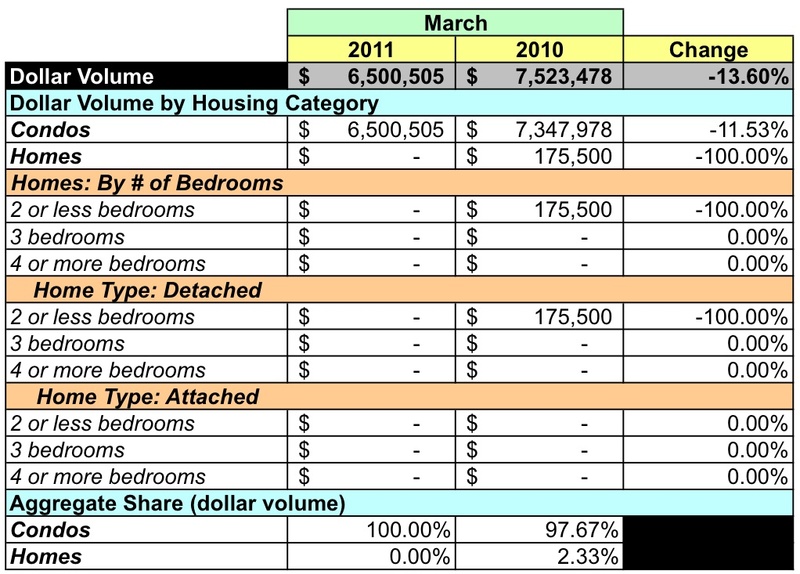 Compared to the same month in 2010, aggregate dollar volume was up 16.64%. The average sales price increased by 2.06% and the median sales price rose 18.65%. Two condos and 6 homes sold in February, about the same proportion as last February. The average price for a home fell 2.88%; condos rose 17.35%. Dollar volume for homes grew 16.55% and increased 17.35% for condos. The most expensive home sold in 20912 closed at $600-799K; the least expensive home sold for $150-199K. 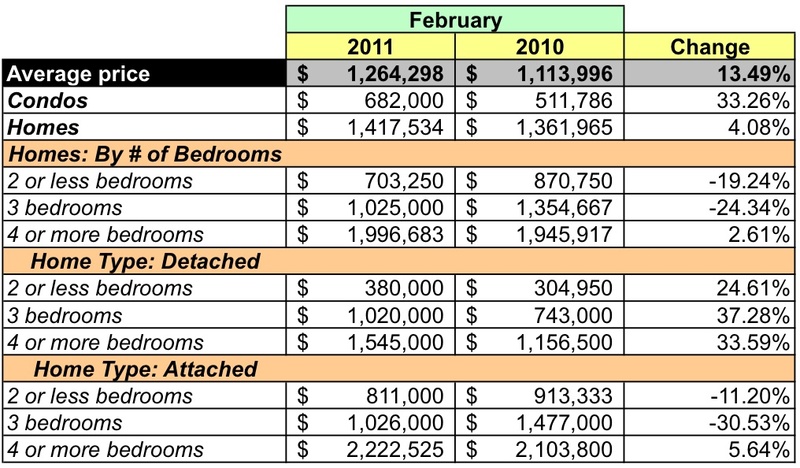 The two condos sold in February went for less than $200K. The data for 2008-2011 indicate that about 6-8 homes sell in February. At February's sales rate there's about a 12 months supply of condos and 6.88 months supply for houses listed in 20912, both of which are signs of a market where there's room for pricing negotiation; in fact, in February homes sold for about 95.7% of list price. Generally speaking, February's total sales activity (closed and new contracts) was the lowest since 2008 although it was better than February 2007. Of the 67 homes with active listings in February, about half (27 houses and 7 condos) were listed between $200-500K. These price points make 20912 an attractive area for home buyers to explore this spring.